You guys have been going nuts for our Woozworld gift cards at your favorite Target, Toys R Us, Kroger and Walmart Canada stores! With WoozMas quickly approaching we want to give you Woozens even more cool stuff and the chance to be extra FESTIVE! And now we’re adding a free giant woozmas head! When you redeem your Woozworld gift card online, one random giant head will be added to your inventory. 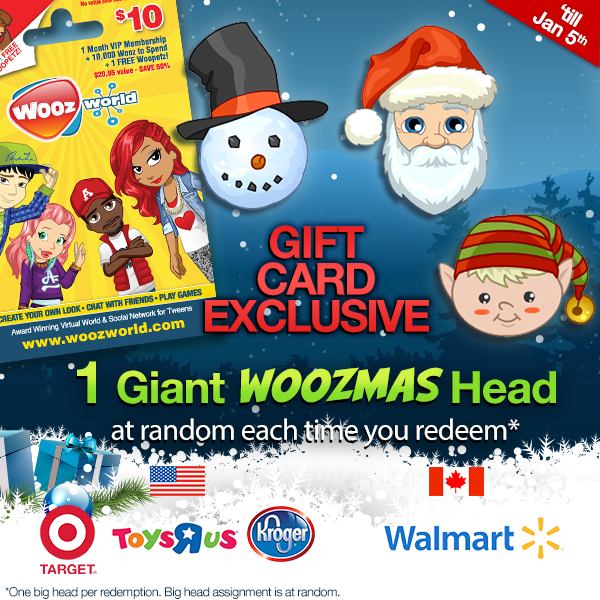 There are a total of 3 LIMITED EDITION giant WoozMas heads to collect:Collect one or collect all 3 ! These heads are only available through gift card redemptions. The giant WOOZMAS heads are available between December 15th to January 5th. Don’t miss your chance to be the most FESTIVE of your friends and bring on the holiday cheer!! Personally, who cares about the free giant head, honestly their ugly and you only wear them once then they just go at the bottom of your inventory until next year, but I guess it's something.